Oil-Electric: Boxcars Go to Sea - CN "AquaTrain"
Boxcars go to Sea – The update! 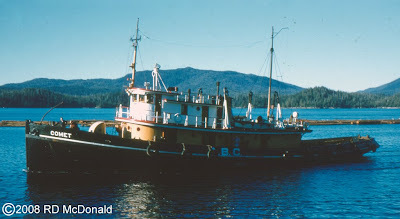 As I first conveyed at the beginning of this blog, my late Dad, Harry McDonald, served as Chief Engineer on the "M/V Comet (LT 393, Miki Class) from 1956 to 1959. 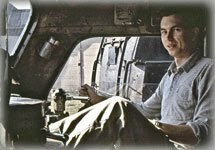 We lived in Prince Rupert from 1957 through 1959, and it was here, at age 14, I became deeply interested with railroading. 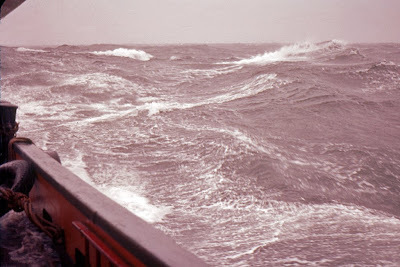 I am not sure of what transpired after we left, although we do know a fire destroyed the “M/V Comet” in 1966 at Prince Rupert, and she ended her days scuttled at Port Ludlow on Puget Sound. And Ketchikan Pulp was shuttered in 1997. Lower 48. 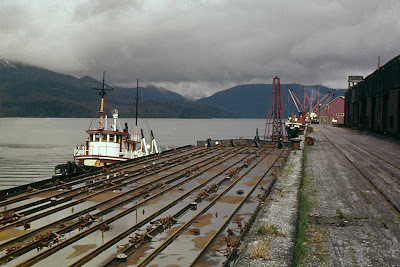 Railroad barge connections from the Lower 48 with Alaska Railroad were primarily from Seattle to the Port of Whittier. 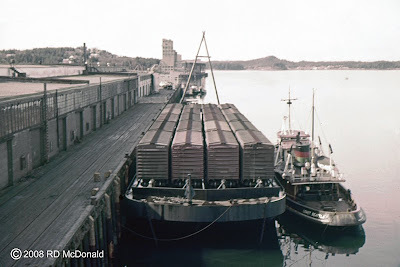 However in May 1962, the Canadian National – Alaska Rail Road “AquaTrain” car barge service was initiated. 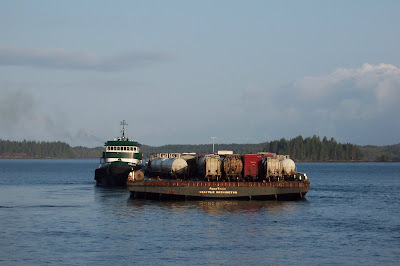 The rail barge is loaded at the very same rail bridge slip at Pillsbury Point in Prince Rupert where I spent many hours watching “the Ward Cove connection.” Towing responsibilities passed through several operators, finally to Foss Tug & Barge of Seattle, known now as Foss Maritime. In 1982 a massive new car barge bearing the name “AquaTrain” was placed in service. The barge “AquaTrain” is 425 long, 100 feet wide, with a capacity of 45 rail cars on 8 tracks. Each string of cars is coupled to the forward bulkhead of the barge. Each car is supported at each “corner” with a screw jack and ratchet chain and hook assembly. Brutal run. 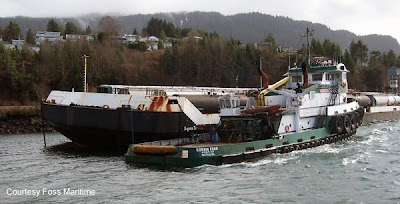 As of this writing, the “M/V Corbin Foss” built in 2003, is assigned the 1,450 nautical mile round trip, over what can only be described as “optimistic” at best passages, across the Gulf of Alaska. 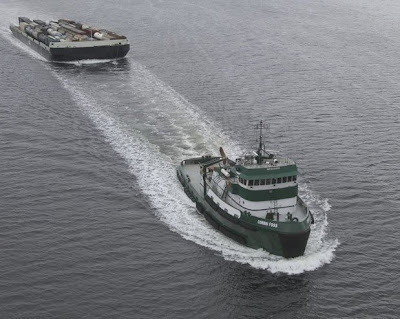 The “M/V Corbin Foss”, at 142 feet by 40 feet, is rated for service world wide, being equipped with two FM/ALCo V-18 diesels, giving her 8,200 hp, the muscle needed for this run across the Gulf of Alaska. After the termination of locomotive production in 1969, ALCo locomotive designs were transfered to the Montreal Locomotive Works, who continued their manufacture. The diesel engine business passed through several ownership changes, and ended up in the hands of Fairbanks Morse! Fairbanks-Morse continues to manufacture ALCo-designed engines in addition to their own design. Following Foss tradition, the "M/V Corbin Foss," is named for Corbin Foss Hansen, the great, great, great grandson of company founders Thea and Andrew Foss. Corbin was born on March 5, 2002. A round trip in the summer months usually takes 8 to 9 days, whilst a round trip in the winter months usually takes 11 to 12 days. A study published in 2005 stated that if the Corbin Foss made 35 round trips to Whittier, 1,575 cars would be transported. Another study concluded that overall, 7% of freight sent to Alaska is via rail car. 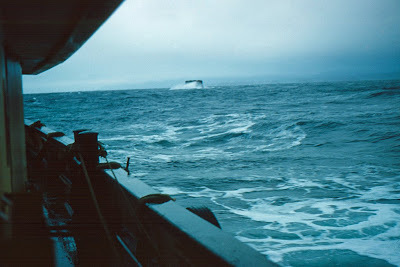 Crossing the Gulf of Alaska. Since the "Comet" travelled the Inside Passage to Ketichikan, there was only one brutal exposure to the Gulf whilst crossing Dixon Entrance. 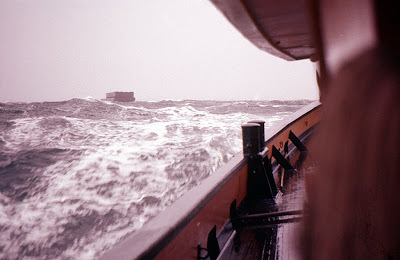 And these photos were taken on "good" days, because in "bad" days, all hatches were literally battend down! On several trips I made with my Dad, we actually had to travel 20 miles up Portland Canal before it was safe enough for us to make the right turn down the Canal and across Dixon Entrance. My Dad went on to work for Foss for a couple of years, and here he is on the “Mary Foss” bunkering at Coos Bay. 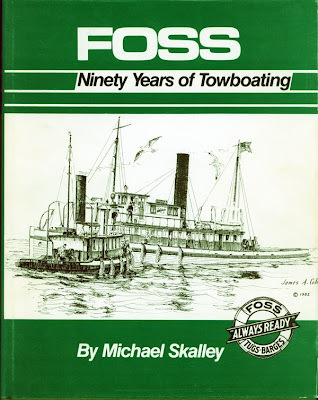 He had a photo or two published in Mike Skalley’s definitive work on the history of Foss Maritime. 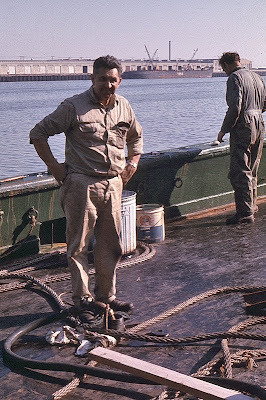 My “Thanks” to Mike Skalley, Foss Maritime Company Historian and Manager of Pacific Northwest Customer Service, who knew my Dad, and authored the definitive history of Foss Maritime, to David Hill for providing the photographs, and to Laurie Zuvich for fielding my phone calls. Since this was written, the "Corbin Foss" was involved in a serious waterfront fire. While I am passionate about railroads, this post was real neat too. I appreciate the working of Foss, having read the pictured book a few years ago. Thanks for the FMALCO link. I knew there was some connection, but this was neat proof that those engines are still around. I'll be making my way up to Prince Rupert this July and I'd love to get a little more info from you on the Aquatrain operations. Please send me an e-mail if you get the chance.